The standard big bang model, having triumphed in the 1960s over a rival cosmological theory, reigned triumphant over the remainder of the twentieth century. The standard model even gained a significant addition: the inflationary universe theory. 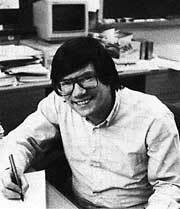 In 1979 a young American particle physicist, Alan Guth, proposed that important cosmological features can be explained as natural and inevitable consequences of new theories of particle physics. Guth showed how a huge “inflation” could have taken place in the first minuscule fraction of a second of the universe’s evolution. In this tiny interval the universe could have expanded at an astonishing rate, then slowed down. After that the “inflationary universe” theory merges with the standard big-bang theory. In play here is a philosophical preference: that cosmological features should be explained as natural and inevitable consequences of theory, rather than be merely arbitrary parameters revealed by observation. The same philosophical preference guided Copernicus and other early cosmologists when they chose between rival theories that could not be separated by observations. The feature that Guth’s theory was trying to explain was the mass density of the universe. As he and many other scientists realized, if the density exceeds a certain critical value, the gravitational pull of each mass on every other mass will slow down the expansion of the universe — and eventually reverse it, reuniting everything in a “big crunch.” If the density is less than the critical number, the universe will expand forever, resulting in a “big chill.” At the critical density, the resulting “flat” universe will continue to expand, but at an ever slower rate. Gravity bends light, as Einstein showed. In this Hubble Space Telescope image, a cluster of three massive galaxies 7 billion light-years away (orange) is bending light to create multiple images of a galaxy more than 11 billion light-years away (white blurs). Such “telescopes” are used to study the otherwise unobservable galaxies created early in the history of our universe, which give evidence about the universe’s age and composition. The problem is that the mass density of the universe at its creation was amazingly close to the critical density. Otherwise, we would not now exist. Had the initial density of the universe differed from its actual value by as little as one part in 10 to the 60th power, all matter would long ago have been crushed beyond recognition in the big crunch, or torn apart beyond recognition in the expansion of the big chill. There would have been no time for planets to form and living creatures to evolve. So there would be no intelligent life to contemplate the fact that the density is precisely what is needed to escape from oblivion. care of that automatically. But why do the laws work so well? Philosophers have elevated such thoughts into the “anthropic cosmological principle.” In its weak form, the principle states that the universe must be such as to admit and sustain life. From Descartes’s “I think, therefore I am,” we proceed to, “I am, therefore the nature of the universe permits me to be.” The creation of stars, planets and life would also have been made impossible by slight changes in the values of other physical constants, including the strengths of fundamental forces such as gravity and electromagnetism and the masses and charges of subatomic particles. The remarkable set of coincidences that seems to have been necessary for life has prompted grandiose inferences. Are there infinitely many universes, each with slightly different numbers for fundamental constants, or even slightly different laws of nature... and we are in one of the few that holds intelligent life? Asking why we are in a universe just right for life, rather than one of the others, would be like a fish asking why it is not on dry land. Fundamental physics theorists are working on ways to describe such a "multiverse." Or is there a single universe, created and fine-tuned so that intelligent life could evolve in it (the “strong” version of the anthropic principle)? If so, some would argue that such precise tuning implies intelligent design. This sounds much like the 18th-century concept of a 'watchmaker' God who created the universe and left it to evolve by itself. This watchmaker idea is entirely different from current claims, contrary to the evolutionary theory, of the ongoing "Intelligent Design" of living organisms. With such questions we pass from the realm of science into faith and religion. Why the density of the universe after the big bang came very close to the critical density is called the “flatness problem.” The standard big bang model offers no answer, other than “that’s just the way it was.” In the inflationary theory, however, a brief burst of exponential expansion automatically flattens everything, driving the density, no matter what its initial value, to almost exactly the critical density. This does not answer why the other fundamental numbers are just right for the existence of life, but it does offer a solution to the flatness problem. The inflationary theory can solve another problem, that of “horizon distance.” This is the maximum distance that light can have traveled since the beginning of the big bang universe (this has recently been narrowed down to about 13.7 billion light-years). The cosmic background radiation is observed to be uniform over a volume of space much greater than the horizon distance. How could regions of space so far apart have adjusted themselves to emit identical levels of radiation? An inflationary universe would have been far smaller during its initial phase than the standard big bang model provides. In fact, it would have been small enough for light to cross even in the first tiny fraction of a second. Thus all parts of the universe could have come to a uniform temperature before the inflation process switched on. Uniformity is good, but there can be too much of a good thing. Our galaxy, our planet, and even ourselves, are tiny non-uniformities in a generally uniform cosmos. Small primordial non-uniformities of matter were needed so that gravity could start to pull matter together into galaxies and other cosmic structures. But why would one part of the early universe have been different from any other part? In fact space-time is always fluctuating on a sub-microscopic scale, according to the fundamental "uncertainty" theory of quantum mechanics. These fluctuations are extremely small, but during the inflation process they would have been stretched enormously. The resulting wrinkles in space-time could have given a start to the clumping together of large-scale structures like a galaxy or a cluster of galaxies. Cosmological theories live or die by their predictions. Astrophysicists George Smoot and John Mather proposed to seek the tiny differences from uniformity in the cosmic background radiation that the inflationary theory predicted, and NASA built a costly satellite that could do the job. In 1992 they reported finding wrinkles in the background radiation, of the size predicted for seeds out of which our complex universe grew. 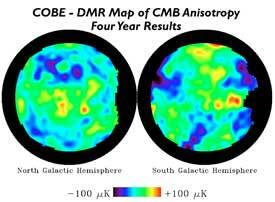 A “Map of the Early Universe” as seen by NASA’s Cosmic Background Explorer (COBE) satellite This false-color image shows tiny variations in the intensity of the cosmic microwave background, “fossils” of the random fluctuations within the Big Bang fireball in its first moment of existence. 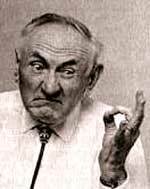 In the 1930s, maverick astronomer Fritz Zwicky (above) insisted that galaxies harbor a huge quantity of unseen matter. Half a century passed before Vera Rubin (below) showed that he was right. During the last several decades of the twentieth century, particle physics increasingly drove advances in cosmology. Meanwhile, particle physicists had pushed the limits of existing particle accelerators and public funding for yet larger instruments. They turned increasingly to cosmology for information regarding the behavior of matter under extreme conditions, such as prevailed in the early universe. Since the 1970s, physicists have worked on a “string theory” that they hope can explain all the laws of physics and all the forces of nature in a single equation. In this theory, the basic constituents of the universe are tiny wriggling strings rather than particles. Cosmologists, however, have found no experimental evidence for string theory, nor have they thought up any prediction of observations that could refute it. 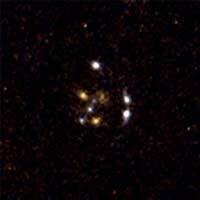 If some of the original submicroscopic strings were stretched as large as galaxies during the brief inflationary spurt of the early universe, they might now be snapping under enormous tension, and the resulting ripples in space-time might be detectable by the new Laser Interferometer Gravitational Wave Observatory. Zwicky's radical ideas and pugnacious personality brought him into frequent conflict with his colleagues at Caltech. They considered him crazy and he considered them stupid. New kinds of particles might be needed to answer an old question of "missing matter." Back in the 1930s, astronomer Fritz Zwicky had measured velocities of galaxies in clusters and announced that the clusters should fly apart. The gravitational pull of the visible matter was not enough to hold the fast-moving galaxies together. Other astronomers thought some simple explanation would eventually turn up, perhaps an error in the observations. But in the 1970s, when Vera Rubin with W.K. Ford measured the rotations of individual galaxies, to their surprise they discovered the same problem. The outer stars were orbiting so fast that they should fly off, if nothing held them but the gravitational pull of the visible stars. Studies by other methods confirmed that we see only about 10 percent of the mass in the universe. The observations and calculations from big bang theory only hint at the remaining 90 percent. Some of the invisible universe may consist of stars that emit very little light, such as "brown dwarfs" or primordial black holes. "Weakly interacting massive particles," predicted by theoretical physicists, might constitute some of the missing matter, but WIMPs have not been detected in the laboratory. Other theories point to topological defects in space-time, cosmic wrinkles left over from the early universe. Early in the 21st century, observations of distant supernovae and other lines of evidence made the picture still more puzzling. In addition to the “dark matter” there seems to be “dark energy.” This may be causing the expansion of the universe to actually accelerate, perhaps to rip apart galaxies and even matter itself in the far distant future. The “dark energy” may be related to a natural extension of Einstein’s equations of general relativity. It may also be related to the quantum fluctuations of space-time and other strange features of fundamental physics. The only thing that is certain is that there is still much to be learned — surely as amazing as any of the wondrous things we have learned already — as cosmologists continue their cosmic journey. Galaxies like grains of sand. A tiny part of the sky, photographed by the Hubble Space Telescope’s Deep Field survey. Almost every smudge in this image is a distant galaxy. For cosmology today, see our LINKS page.